David Bieda is, and has been, a recognisable face to people involved in the many neighbourhood groups in Covent Garden since 1971. Moving into the Peabody Estate in 1971 as a youth and community worker with the charity Street Aid, he quickly became involved in the campaign to put a stop to Greater London Council’s original plans for redeveloping the area. His voluntary work for Covent Garden has not stopped since: as he himself is keen to point out, ‘it’s one thing arguing against something, it’s another putting something else in its place’. He has helped make that ‘something else’ happen through working across various committees over the last 40 years, right up to the present day when he still Chairs the Seven Dials Trust. He now lives in Soho, just a few blocks away from where we are conducting our interview in the Seven Dials Club. 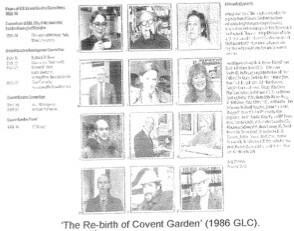 So important is David to the Covent Garden story, he appears on the back cover of Julie Hillman’s book The Rebirth of Covent Garden (along with local hero Rev. Austen Williams and other activists who you will find on this website, and he has been interviewed by researchers many a time, so it was very kind of him to agree to answer my questions. David remembers the first time he heard about the GLC’s plans to redevelop the area very soon after he first moved into the Peabody flats. ‘Someone came to our office in Southampton Street…Our office was due to become a ventilation shaft for an underground road!’ the GLC’s plans not only included a proposal to introduce underground roads, but to demolish ‘two thirds’ of Covent Garden’s buildings. When asked what inspired him to become involved with the campaign, David muses that his job as a community worker for Camden Council naturally led him into it. He also felt it was important for the area that its old Victorian buildings, its ‘physical fabric’, be preserved for the sake of the population who had been there so long. He realised that a plan was needed since when the market moved there were many empty buildings, but wholesale demolition was not the answer. Although a relative newcomer to the area (being one of the first people to move into Peabody who wasn’t a ‘son and daughter’ of a current resident), on finding out about the plans he quickly found himself at some ‘enormous meetings, with five/ six hundred people’, and attending the marches and demonstrations which are documented so well in the photographs on this website. He recalls how these meetings saw residents coming together with small local business owners, ‘with lots of support from the press’. He says that he was initially surprised that ‘the people who made the biggest protest were the people who didn’t own where they lived… they felt the most ownership over the area, even though they didn’t own it’, but of course, it was because they had ‘lived there for generations’. This activity, David notes, was all ‘inspiring’: but he is equally keen to point out that it was not necessarily these more photogenic events that saved Covent Garden and produced the streets that remain today. 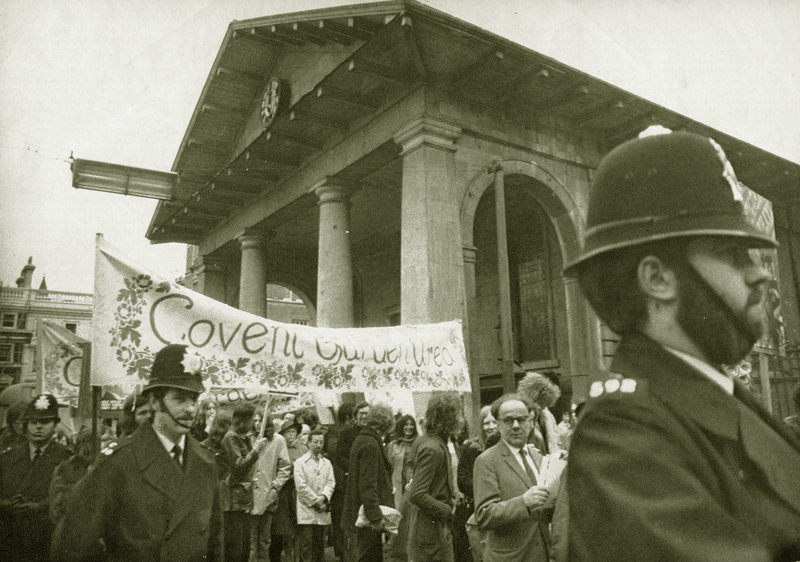 He continues to describe that it was ‘the Public Inquiry in 1971… which was key’, as it saw Covent Garden campaigners largely demolish the GLC’s plans once and for all. David organised and led the case for ‘Street Aid’ with 12 witnesses. He tells me how the opposing lawyer, John Taylor QC invited them for dinner a few days into the Inquiry, to ‘assist’ them in their case! The evidence that David and his team presented helped convince Geoffrey Rippon, then Secretary of State, to create a formal consultation mechanism (named The Covent Garden Forum) and to list around 250 buildings. This write up of course simplifies the process, and can not give any justice to the amount of time or energy that David and his fellow activists put into the Inquiry, or into the subsequent Covent Garden Forum, and other, meetings. The banner-waving and garden parties look great on film, but David shows that it was in meeting rooms that the most important work happened over a period of many years. He remembers that, really, for residents in Covent Garden it felt like nothing happened for a very long time after the Inquiry even though they won the case. Covent Garden still remained a ‘no through area’: ‘Nobody drove through it, and very few people walked through it’. One particular memory certainly is worlds away from the packed market we know today: David recalls sitting in the central piazza with a tray of coffees taken from his Peabody flat round the corner with a group of friends on the weekend. As ever, it was silent and empty, when all of a sudden a group of Japanese tourists stumbled upon them looking very lost indeed, and no one really knew what they were looking for – after all, the market on a weekend was more of a ‘no man’s land’ than it was during the week! The feeling of Covent Garden as ‘no man’s land’ only became exaggerated following the move of the commercial market traders to Nine Elms in 1974. For Covent Garden residents, ‘there was a void… it wasn’t just the empty buildings but a lack of activity’ that marked the time following the move. But it was from this time that the work of the Covent Garden Community Association and the Covent Garden Forum increased. ‘Someone should write up its [the CG Forum’s] activity!’, David exclaims. Perhaps this interview can be the start. David was active on the Forum for its entire existence. It was made up of 15 local business representatives and 15 residents, elected from the electoral roll. As the GLC’s original plans had fallen, it was the Forum’s job to work with the GLC to steer the new direction. David remembers that ‘people were not willing to invest in the area’, that property companies were ‘incredibly short sighted’ not to snap up such central land. 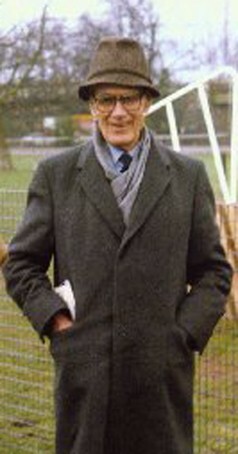 However, the fact the GLC remained tasked with the development probably made the Forum’s work easier: ‘every decision by the GLC went through the Forum… We had two non voting places on the GLC Covent Garden Committee which made the ultimate decisions.’ He feels that the CGF had ‘enormous influence’ on decision-making. He repeats that having a protest is one thing, but saying what should happen is much more complicated. ‘It took 14 to 16 years to ‘rebuild’ the area’. The Covent Garden Plan, created during this process, is a good document to take a look at, David notes, it has lots of maps, with small areas focussed on, and developments all carefully considered, so would be interesting to anyone looking at the building history of the area. The work certainly sounds complicated and exhausting, but asked if he ever wanted to give up David seems to never have considered this: ‘no, no, it was very interesting’, he insists. He seems to have revelled in being able to play such a role in shaping Covent Garden as we see it now. David explains that when he first moved into the Peabody Estate, most of his neighbours were sons and daughters of existing tenants, many of whom were descended from ‘Irish families who had fled Ireland in the 1840s’. He muses, ‘it was like moving into Victorian England’, with everyone seemingly employed by the ‘Market, Fleet Street printers, and the Royal Opera House’. He remembers knowing three sisters who had only left Covent Garden twice in their whole lives, and whilst many residents were moved around during the redevelopment of the area, most people were moved back in once redevelopment had finished. Furthermore, the introduction of the ‘Right to Buy’ scheme however brought the most drastic change. David speculates that perhaps ‘70-80% of people left’, and he suggests that since then ‘the community ethos seems to have changed’. This does seem to be an observable truth. David notes that ‘not many people’ come to the Seven Dials Club (in which we are sitting) any more ‘it’s a Friday night! And how many people are sitting out there in the Community Centre? Three? Four?’. He sighs that ‘only a tiny minority of the local population’ uses the community garden. When David first moved to Covent Garden, he ‘liked the fact that it was the opposite to a suburb’, and Seven Dials remains his favourite part of the neighbourhood as it retains that similar feeling. But he laments the fact that ‘the piazza is over commercialised’, like ‘every other high street, which I don’t think is very interesting’. He notes that it is a shame that the GLC was dissolved, as it was them who were able to retain a more ‘balanced retail offer’ – presumably because they were not just focussed on profit. But of course, the GLC is no more, and the buildings are now mostly privately owned. 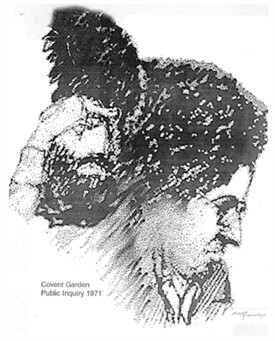 Asked at which moment of time he believes Covent Garden was at its best, he asserts, ‘I preferred it just after the market was restored,’ that is, just as it had been restored to its former glory and was less packed with tourists and tables and chairs. Listening to David, you realise how much redevelopment, however lovely it looks, can have negative effects on everyday life; the effects are often bitter-sweet. There’s nowhere to go now if you want to go to a local shop, a butchers or a bakers. But David still enjoys the area; he is taken aback when I ask whether he thinks that the redevelopment has been a negative thing overall. He shakes his head fervently, citing ‘the Donmar theatre, good new restaurants, new social housing and all sorts of public realm improvements’ as welcome additions to the area. He likes to go out to eat, to go and see films, go and see friends: ‘I do the same as you do!’, he exclaims. You begin to understand then why his voluntary work with the CGF and, ongoing, with the Seven Dials Trust and the Covent Garden Area Trust is just ‘so interesting’, such ‘fascinating work’. David isn’t against development full stop, he is not concerned with freezing Covent Garden in time. He still believes that ‘Covent Garden and Soho are very village-y’, and is happy about this, although he is hesitant to articulate any hopes for the future, as ‘you can’t control it… people always want to make more money.’ He speaks with the resignation of someone who has dedicated a lot of time to thinking over complex proposals, always trying to see the bigger picture, and working long hours to convince others. It is easy to understand how he loves the area, but that after 40 years, inevitably at least a little cynicism will creep into even the most passionate activist. His continued dedication to the area however is astonishing, and it is obvious that David will continue to serve the community of Covent Garden in any way he can: although he would never use such words to describe his activity: ‘I wouldn’t use the word community, I’d use the word neighbourhood’, and he would never call his work a service, although, to an outsider at least, these terms certainly seem to describe his dedication and commitment to the area most fittingly. This interview was conducted as part of the Lottery Heritage Fund project, ‘Gentleman We’ve Had Enough: The Story of the Battle to Save Covent Garden’. On Friday 10 May 2013, King’s College London students, supported by Westminster Archives, the Covent Garden Community Association, and the Centre for Life-Writing Research at King’s College London, interviewed Covent Garden residents about their memories of the area. 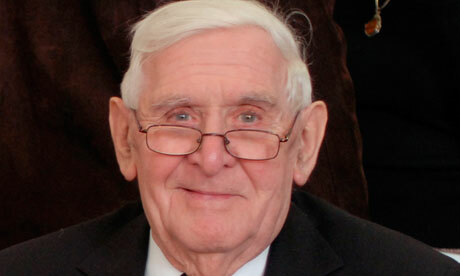 Students’ accounts of their interviews have been added to this Covent Garden Memories website. For more information see: www.kcl.ac.uk/artshums/ahri/centres/lifewriting/gentlemen.aspx. This page was added by Francesca Allfrey on 17/07/2013.